Cappuccino shortbread coffee bean cookies have become a yearly treat in the Hawksworth household. 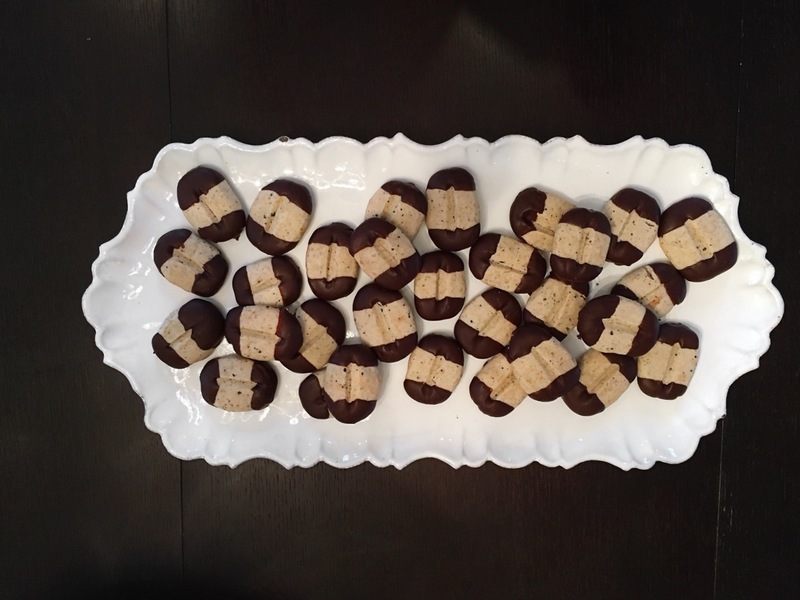 They add a delectable twist to a classic Christmas recipe; the strong scent of espresso and the warm aroma of rich buttery shortbread fills the house and reminds me that the holiday season is well underway. In an electric mixer bowl fitted with the paddle attachment, cream butter and sugar on medium-high speed until light and fluffy for about 3 minutes. Beat in coffee powder and vanilla. Sift flour and cornstarch together and stir into butter mixture. Cover with plastic wrap and refrigerate until well chilled (at least 2 hours or overnight). Mold dough into the shape of coffee beans using about 1 tsp for each cookie. Using the back of a knife press an indentation about 1/8” deep, lengthwise on the top of each cookie. Bake on parchment-lined sheets for 15 minutes, rotating sheets halfway through until cookies are just beginning to brown. Cool completely on racks. Once cooled, dip both ends into melted chocolate and place on waxed paper until chocolate has hardened.